Nanay Herminda Geraldoy, 64, who is from the province of Guimaras and a former Home Economics teacher, was told by her husband that she is way too old to attend trainings. But instead of minding his comment, she just shook it off. “Sabi ko sa asawa ko, bata pa ako! Kayang-kaya ko pa! Pursigido talaga akong pumunta rito para malaman ko kung paano magmanage ng isang restaurant.” (I told my husband, I’m still young! I still can! I am very determined to go here and learn how to manage a restaurant.) And that lead her landing on Manila and becoming a part of ABS-CBN Lingkod Kapamilya Foundation-Bantay Kalikasan’s Basic Service and Food Standards Training -- a project under BK-Green Initiative which is in partnership with Raintree Restaurants, a chain of 11 specialty quick and full-service restaurants. 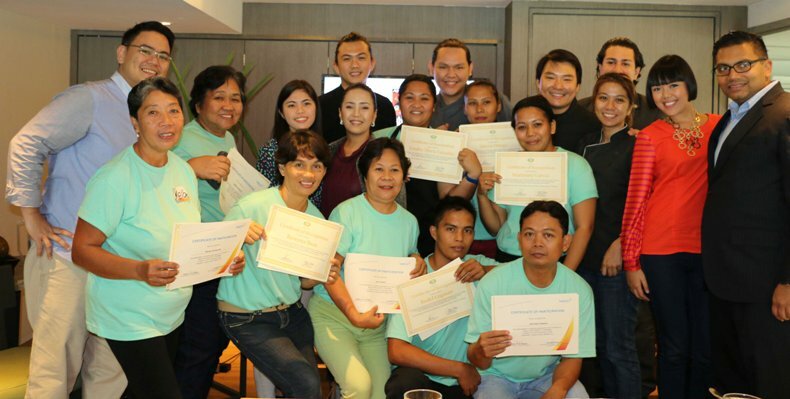 For five days, Nanay Herminda, together with the other eight representatives from eight assisted provinces of BK-GI (Western Samar, Leyte, Sarangani, Guimaras, Romblon, Oriental Mindoro, Palawan, and Sorsogon), was able to learn the importance of personality and image branding, basic service standards, food safety, and how to prepare the menu, recipe sheet, and how to compute food costs. It was a total immersion. The representatives were grouped into three and coached by three professional chefs. They also visited different restaurants and food parks to learn and observe the operations and management. On their last day, a practical test was done where in they became the chefs and the servers entertaining their guests. Each of them prepared the popular dish of the province where they come from. The tie-up with Raintree Restaurants and Bantay Kalikasan-Green Initiative aspires to uplift the eco-tourism of each assisted province. Bantay Kalikasan’s Program Director, Norie Garcia, also notes the contribution of the training. By equipping people the right information and skills, ALKFI, together with its partners, continues to fortify the lives of people in the community. GREEN Initiative (GI) is a national movement established by Bantay Kalikasan that aims to nurture and protect the Philippine environment in a way that benefits the communities living around it.